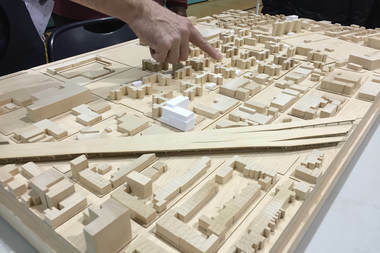 A 3-D model of the Red Hook East and West Houses campus displayed during a meeting in February 2016. The white block show the proposed locations of the power plant and utility pods. RED HOOK — The city is looking for a developer to create a financially self-sustaining heat and power generating system for the largest public housing complex in Brooklyn, officials said Friday. Under the plan, the developer would "finance, design, construct, and operate a campus-scale heat, hot water, and electricity generation and delivery network" for the 28 buildings that comprise Red Hook Houses East and West, according to the New York City Housing Authority. "NYCHA believes that the distributed energy component of this project has the potential to be a self-sustaining enterprise, and the RFP provides an opportunity to raise dedicated funds for that," NYCHA spokeswoman Zodet Negron told DNAinfo Friday afternoon. NYCHA released its "Request for Proposals" on Wednesday. The proposals will be submitted in two parts — Part 1 is due July 22 and Part 22 by Sept. 9. "The Red Hook Houses District Energy System" will consist of two central plants, to be located on opposite ends of the NYCHA land parcel, two heat and power distribution networks and backup generators, according to a press release. The system would be able to generate and distribute heat, hot water and electricity to all the NYCHA buildings through the central plants. “As part of NYCHA’s Sandy Recovery program, we are working to build back stronger and more resilient than ever before,” said NYCHA Chair and CEO Shola Olatoye. City officials also say the system will be an efficient way to reduce greenhouse gas emissions. “NYCHA will be harnessing the energy produced in multiple ways, and eliminating individual building systems, which is a smart way to set up a system that will be better to maintain and control," said Nilda Mesa, director of the Mayor’s Office of Sustainability. When Hurricane Sandy hit New York in October 2012, Red Hook was one of the hardest hit neighborhoods in the city. In NYCHA's Red Hook Houses, most tenants lived without heat and electricity for weeks. Basement flooding damaged heat, hot water and power service, while also destroying its boiler plants. The RFP would also build on the development of a proposed Red Hook Community Microgrid that's being designed by Community Board 6 and the Red Hook NY Rising Committee, according to the press release. A microgrid would also allow NYCHA to disconnect from the main electrical grid and generate its own electricity in the event of a catastrophe. A NYCHA microgrid and network would be capable of future connection to the Red Hook Community Microgrid project. The recovery and resiliency effort in Red Hook after Hurricane Sandy has been a massive and complex undertaking, with multiple projects in various stages of design throughout the neighborhood. The Federal Emergency Management Agency [FEMA] has allocated $438 million for work on NYCHA buildings damaged by Sandy. Those funds will also be used to restore playgrounds, repair roofs, fix Sandy-damaged electrical, mechanical and plumbing systems as well as restoration of a local senior center. "FEMA funds can pay for cogeneration/microgrid components that are consistent with the restoration and resiliency of electrical and heating systems that were damaged by Sandy," the spokeswoman said. There has also been discussion of an "integrated flood protection system" in Red Hook. The selected project developer will work closely with architecture firm KPF, which presented conceptual renderings of two power plants and 12 "utility pods" for Red Hook Houses back in February. A map of the proposed energy distribution system shows the two central plant buildings located near Coffey Park between Dwight and Richards streets and near Clinton and West 9th Street. Officials had previously said the Clinton Street structure may lead to demolition of shops and some residences. A pre-proposal conference for the RFP will be held June 29 at 1 p.m. at 250 Broadway, 12th floor.